The global market for gastrointestinal drugs is predicted to witness a steady growth in the coming years, as analyzed by a recent Transparency Market Research (TMR) report. The vendor landscape of the global market features consolidation, with leading three players accounting for a significant share in the market collectively. The top three vendors in the market, viz. Janssen Biotech Inc., Takeda Pharmaceutical, and Valeant Pharmaceuticals Inc. hold over 60% of the total market share at present. Established vendors have deployed strategies such as enhancement of distribution channels, novel product development, and expansion to regional markets. Vendors are also seen focusing on efficient supply chain management and procurement of the drugs, thereby increasing their operational efficiency. This is one of the top strategies that leading vendors have adopted in order to gain momentum in the global gastrointestinal drugs market. Recently, Allergan Inc divested its genetic branch by selling off Anda, Inc., to Teva Pharmaceuticals. This has resulted in Allergan focusing more on key therapeutic areas, and enhance their branding. Other prominent vendors operating in the global gastrointestinal drugs market are Sanofi, Astra Zeneca, Abott Laboratories, Bayer AG, and Allergen Plc. According to TMR analysts, the global gastrointestinal drugs market is projected to rise at a 4.90% CAGR over the forecast timeframe of 2016 to 2024. The market was estimated to hold a revenue of US$45.5 bn in 2015, which is foretold to reach US$61.6 bn by 2024. Expanding interests in research activities for the improvement of these drugs and the developing mindfulness about the accessibility of the medications are likewise adding considerably to the development of this market. 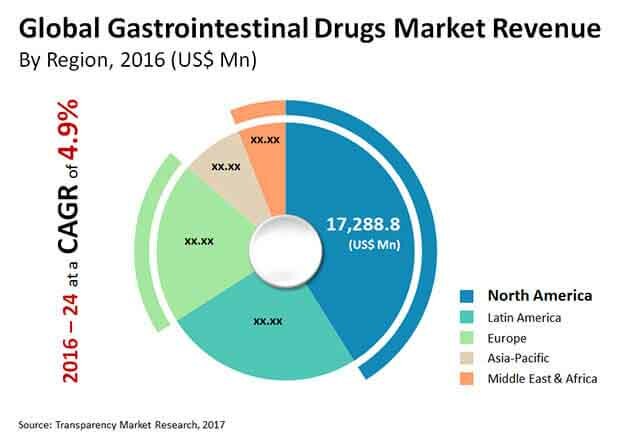 The surge in awareness about the malady and the expanding accessibility of treatment choices is boosting the growth of the gastrointestinal drugs market. Likewise, the innovative headways in the treatment technology are expected to help the market gain traction. Rising number of patients experiencing GI issues, attributable to adjust in the dietary lifestyles, additionally emphatically influences the development of the gastrointestinal drugs market. The high unmet need and interest for better medications and the high commonness of stomach related conditions make the gastrointestinal market an alluring contender for remedial advancement. Moreover, activities initiated by associations, for example, the Centers for Disease Control and Prevention (CDC) that advance tumor screening over the globe are expected to support market development over the forthcoming years. This expansion in activities for screening is required to fuel offers of therapeutics and present lucrative potential to the market vendors. Branded drugmakers and generic drug firms are working together to create conventional drugs after patent expiry, or, in other words, support the development of generics. Likewise, companies are progressively concentrating on creating generics attributable to increment in off-protected drugs in the market. The generic type of segment of drugs is expected to rise at an exponential rate attributable to steady expiries of licenses, cost-viability of generics, and activities by government associations for advancing utilization of generics in developing countries. Likewise, significant pharmaceutical organizations are reliably endeavoring to dispatch generic adaptations of their branded counterparts. As the number of doctor-prescribed drugs being insured for is rising, it is urging patients to buy medications from retail drug stores. These factors are expected to support client tendency toward retail locations. On the off chance that retail drug specialists have any worries with respect to endorsed meds, they suggest options for the equivalent, accordingly guaranteeing higher security.